Alltech Innovations is a part of the Alltech Group of Companies based in Kuwait having its operations across Middle-East since 2002 and recently, in India. Alltech Innovations is an extension of the organized and professionally managed operations overseas venturing into the ever-growing market in India with a business ideal to offer the best in the market with customer-centric focus. It is strategically located in Mangalore servicing the local market and the neighboring states. Alltech Innovations was formed with an aim to consolidate each client’s needs as well as specific project requirements into a form which imbues elegance and good taste coupled with professional work following the prime principles of Assess, Design and Implement. We work with private home owners, investors, architects, property management companies and business owners. Our projects vary from new builds to extensions; from total refurbishments to individual rooms.Alltech Innovations is fully equipped with Consultants, Designers, Engineers and Qualified, Skilled and Experienced workforce to carry out each and every project with precision coupled with stringent quality control and delivery within the stipulated time frame. We pride ourselves on our ability to understand our clients and to translate their ideas, taste and personality into distinctive interiors which far exceed their expectationsAlltech Innovations has the know-how and expertise to conceive, design and execute complete turn-key projects with scope in interiors right from floorings of every kind, decorative gypsum board or wooden ceilings, partitions, Glass and Metal cladding for exterior facades, artistic painting and wall cladding, Kitchens and Baths. 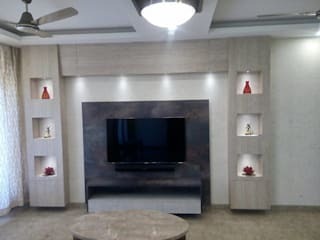 We also believe in complementing each of our unique projects with our in-house designed, made-to-order and customized furniture to our clients’ liking with an uncluttered design and installation. As turn-key interior solutions providers, we also do lighting and Low Voltage systems, namely: access control, security systems, home automation for smart homes, smart-classrooms and boardrooms, digital signage and conference systems. We are also specialized in CCTV and security surveillance systems keeping the property safe from intruders and assuring a complete peace of mind to the owners.Alltech Innovations is about bringing concepts and ideas to reality and turning each of the projects into a master-piece for the discerning client and setting a standard in every one of our project for others to follow. Our professionalism and attention to detail ensures the smooth operation of every project, right up until the last picture is hung on the wall.